The Deep Creek Experience in Great Smoky Mountains National Park includes three impressive waterfalls found among the pristine mountain streams that appeal to anglers and tubers alike. Hikers love the trails that lead to the waterfalls. Cyclists love Deep Creek too; most trails in the National Park are closed to bicycles but not the Deep Creek and Indian Creek Trails. And with camping and picnicking available, what’s not to love about Deep Creek? 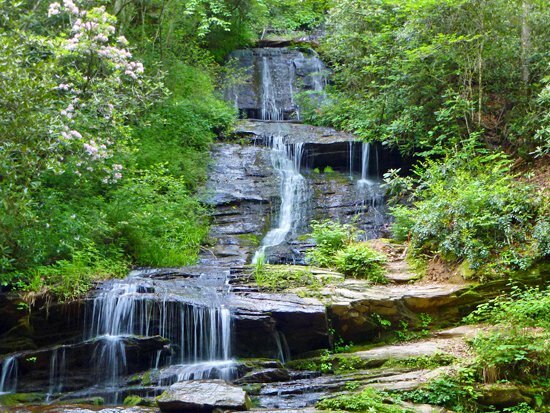 Juneywhank Falls – The beautiful 80-foot cascade, Juneywhank Falls can be viewed along a 1/3 mile steep trail from the Deep Creek trailhead parking area. This is a large parking area at the end of Deep Creek Road which is located across the creek from Deep Creek Campground. Tom Branch Falls – Another impressive 80-foot waterfall can be accessed from the Deep Creek trailhead parking area. Walk along the flat and wide Deep Creek Trail about 1.4 mile to Tom Branch Falls. Indian Creek Falls – Continue along Deep Creek Trail past Tom Branch Falls for another mile to Indian Creek Falls. Follow the trail about 200 ft. uphill to view the top of falls the plunges over 25 feet into Deep Creek. There is a small spur trail that leads to the bottom of the falls. There are two loop trails that can take you to all three trails: Three Waterfalls Loop which is 2.4 miles and Deep Creek-Indian Creek Loop which is a moderate 5 miles and a favorite hike for viewing spring wildflowers. The 6,800-acre valley comprising Cades Cove, one of the most visited areas of the park, provides a glimpse of a bygone mountain lifestyle. Travel in your car or truck (no RVs or commercial vehicles) on a one-way, 11-mile paved loop road. Sightings of deer, turkeys, black bears, coyotes, ground hogs, raccoons, butterflies, and other animals are exciting and common. 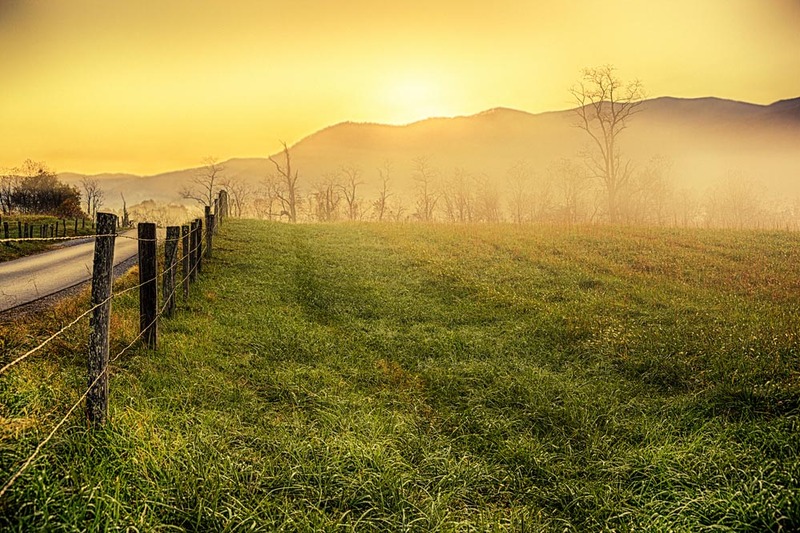 A Great Smoky Mountains Sunrise in Cades Cove. Those seeking an out-of-the-vehicle experience may enjoy cycling the loop or hiking the many trails found in Cades Cove. One of the most popular hikes is to the picturesque Abrams Falls. Midway of the loop, the Cades Cove Visitor Center, home to the John Cable Grist Mill, the Gregg-Cable House, a Cantilever Barn and other farm buildings, is the perfect place to pause. Grassy meadows and banks of the babbling stream provide great picnic venues. Graveyards, located beside several historic churches in the cove, bear mute testament to early residents. The path into the cove is open from sunrise to sunset year-round. It can sometimes take more than four hours to complete the 11 mile one-way loop during the busy summer and fall seasons, and on most weekends. Sparks Lane and Hyatt Lane offer shortcuts out of the cove. The road is closed to motor vehicles until 10 a.m. on Wednesdays and Saturdays from early May to late September. The loop is closed to cars until noon each Saturday in December to allow bicyclists and hikers a quiet journey. Bike rentals available at the Campground Store. Enjoy an ice cream cone from the Campground Store too! Cades Cove Riding Stable offers guided trail rides on horseback, hayrides, and carriage rides from early March through late November. For more information and prices, visit CadesCoveStables.com or call 865-448-9009. A self-guiding booklet is available for a small fee at the Orientation Shelter at the beginning of the loop. Cades Cove Picnic Area has charcoal grills for cooking or consider packing a basket for a picnic in the cove. Don’t forget a blanket and chairs. Please pack out all your trash! Bring binoculars for optimal wildlife viewing. … feeling great in OCONALUFTEE! 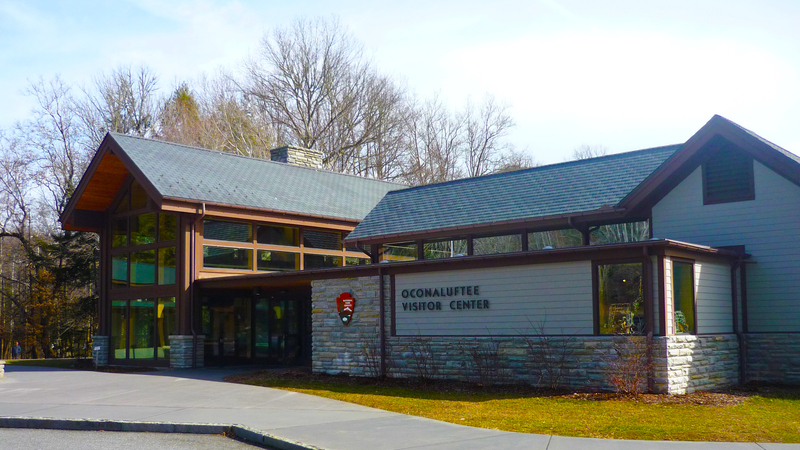 The Oconaluftee Visitor Center is a must stop for any visit to the Great Smoky Mountains! Entrance to the Center is free and it is open to the public every day except Christmas day. The Visitor Center has plenty of parking for cars, RVs and motor coaches. Public restrooms and vending machines are available to the left of the Center’s main entrance. You will find everything you need to experience the Park at your own pace. The Visitor Center offers a unique view into the area’s past at the Mountain Farm Museum – a collection of historic log buildings from the late 19th century that were relocated here from all over North Carolina in the 1950’s. Fishing – The Oconaluftee river and all its tributaries feature an abundant wild trout population. A Tennessee or North Carolina fishing license is required within park boundaries and may be acquired at nearby communities or online from North Carolina at ncwildlife.org or in Tennessee at tn.wildlifelicense.com. Camping – A 138-site campground is located in the valley one mile away in Smokemont and is open mid-March through October for tents or RVs up to 31 feet. Group camping is available through advanced reservations. Back country camping requires a permit. For more info, go to recreation.gov. Hiking – The easy 1.6 mile Oconaluftee River Trail begins near the entrance to the Museum. It is stroller-accessible and follows its namesake stream. It crosses the Blue Ridge Parkway and continues to the park border with Cherokee. The Mingus Creek Trail is the tail-end of the Great Smoky Mountains portion of the Mountains-to-Sea Trail which stretches 6.2 miles from near Newton Bald and runs 3.3 miles down toward Deeplow Gap Trail from the Deep Creek area. From there a 2.9 mile section leads to US 441, just north of the Oconaluftee Visitor Center.A 20-mile leg of the Mountains-to-Sea Trail connects Oconaluftee with the Appalachian Trail near the summit of Clingmans Dome. From Cherokee – 2 miles north on Hwy 441. From Gatlinburg – 30 miles south on Hwy 441. From Townsend – 23 miles east on Little River road. Turn right on Hwy 441 (Newfound Gap Road) and proceed south 28 miles. Park roads may close due to snow and ice, especially at high elevation during winter months. 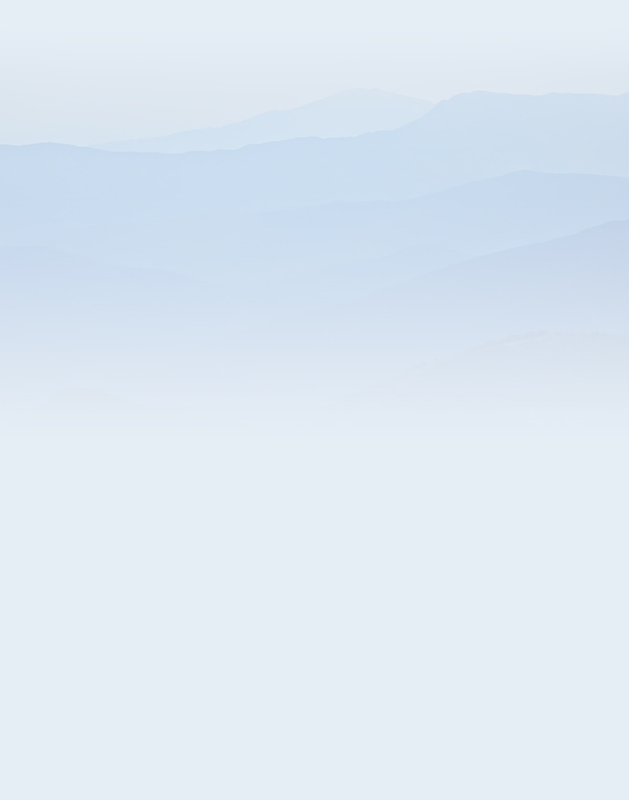 Check road status by following twitter.com/SmokiesRoadsNPS or by calling 865-436-1200 ext. 631. Relief Map – A giant, raised relief map which reveals all of the park trails and roads in great detail. This map provides a sense of the dramatic changes in terrain a park visitor can experience by foot or car. Information Desk – Staffed by park rangers and volunteers who can answer any questions you may have about your visit. Gift Shop – Selling souvenirs of all types, including a great selection of books about flora and fauna, Smoky Mountain history, wildlife, pioneer stories, mountain legends, etc. The shop provides quality topographic maps of the area, basic hiking gear, patches, paintings, traditional mountain food hard goods, and much more. Museum – Hear the voices of Smoky Mountain past! Recordings of early mountain residents relating their experiences and artifacts of mountain life are on display. 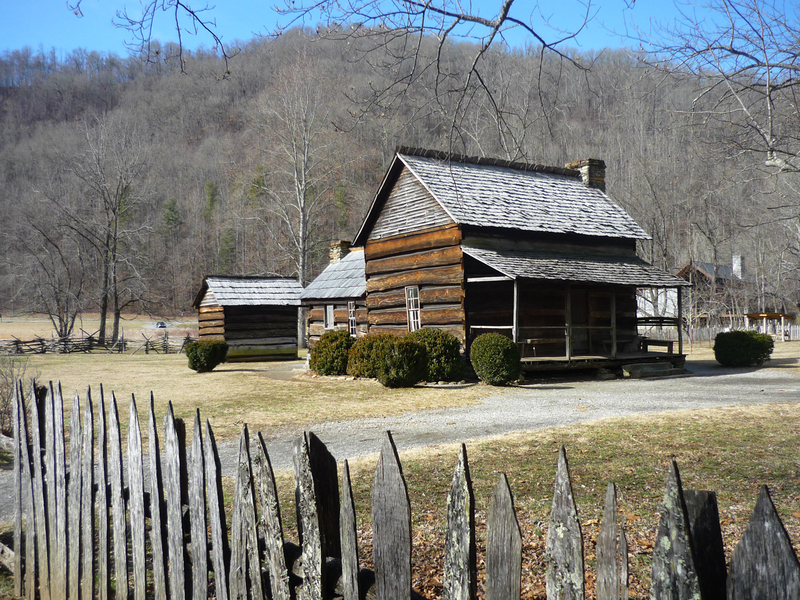 The house, barn, apple house, spring house, and smokehouse provide an idea of how families worked and lived more than a century ago and depict a typical mountain farm during the pioneer days in Appalachia. The Chestnut log construction of the Davis House, relocated from near Bryson City, is a nostalgic nod to the giant Chestnut trees which once blanketed much of the Smokies prior to a blight that decimated the trees during the 1930s and early 40s. Area visitors gain an insight into historic agricultural practices through the gardens that are planted in spring and summer. A large stand of cane is harvested each fall and used in a portable “cane grinder” to manufacture cane syrup in several locations within the park. A barn, located at the site, is more than 50-feet wide and 60-feet long. A modern 2,500 sq. ft. home would fit in the barn’s loft. Demonstrations of farm life and ranger-led programs are conducted seasonally. 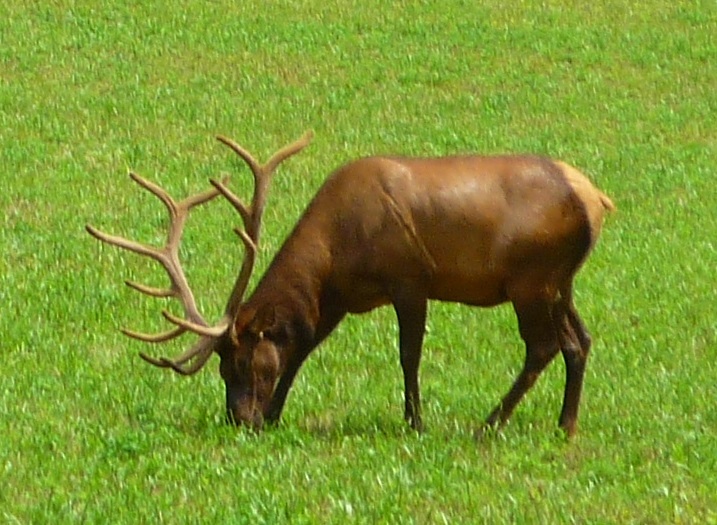 An exciting recent addition to Oconaluftee is the appearance of several large Elk that frequent the broad grassy meadow. A museum, located next to the Oconaluftee Visitor Center, was built in 1947 by the civilian Conservation Corps (CCC) as a ranger station and magistrate’s courtroom. The stone and log cabin was designated as a “temporary” visitor center in 1947 but maintained that title until a new “green design” 1,700 square foot center, the first new visitor service facility constructed in the park since the early 1960s, and also the first designed explicitly as a full-service visitor center, was dedicated in 2011. The Great Smoky Mountains Association provided three million dollars for the facility and Friends of the Smokies donated more than half a million more to provide for inside exhibits which depict the history of life in these mountains from native Americans and early European settlement through the Civilian Conservation Corps and the development of the national park. This is also the site of the Great Smoky Mountains Association bookstore and shop. Public restrooms, vending machines, and backcountry permits are available. 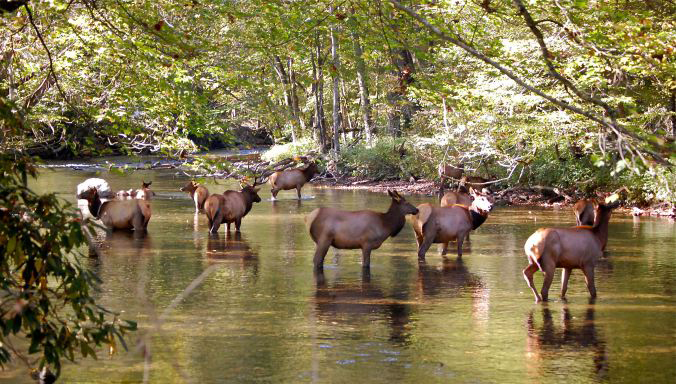 The Oconaluftee area parallels the Oconaluftee River basin which gradually broadens on a southward journey from Smokemont toward the southern tip of the Quallah which comprises the reservation for the Eastern Band of the Cherokee. According to the journals of John Bartram, written in 1775, the term Oconaluftee comes from the Cherokee village named Egwanulti, which means “by the river.” The Cherokee considered the waters of the Oconaluftee sacred and legend has it that the part of the river called Ya’nu-u’nata wasti’yi translated into “where the bears wash,” refers to waters that legend says would heal hunting wounds sustained by the bears. While the Cherokee roamed throughout the Smokies, this is the only known permanent Cherokee settlement within the park boundary. It is thought the village was most likely destroyed in 1776 during the American Revolution. 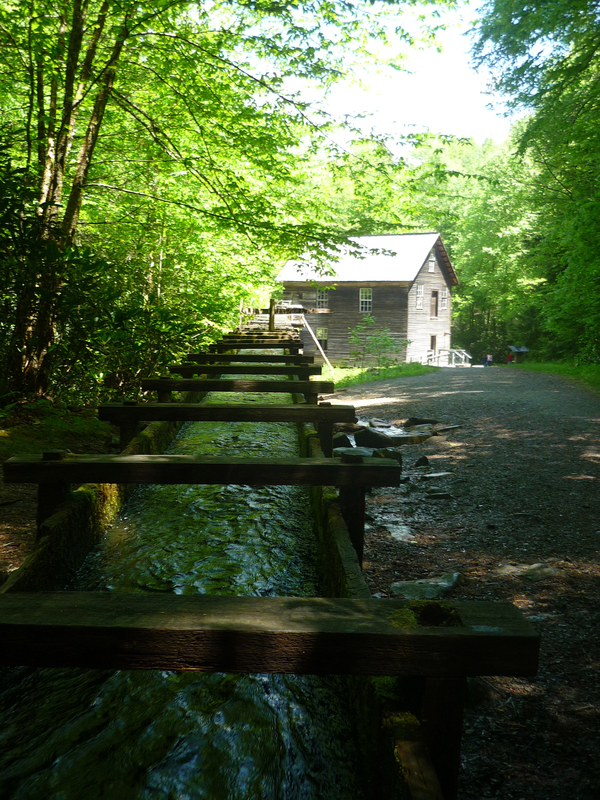 A half-mile north of the Oconaluftee Visitor Center is historic Mingus Mill. Constructed in 1886, the mill, still located on its original site, relies on a water-powered turbine instead of a water wheel to power the mill. An onsite miller demonstrates the process of grinding corn into cornmeal. Cornmeal and other meal-related items are available for purchase at the mill which is open from 9:00 p.m. to 5:00 p.m. daily from mid-March through mid-November and also on Thanksgiving weekend. Exterior walls are cement fiberboard that is impervious to rot and insect damage. Roof shingles, composed of recycled post-industrial rubber and designed to look like slate, have a 50-year life-span. A geothermal heating and cooling system circulates water underground to reach the earth’s constant temperature of 55 degrees then returns the water to heat and cool the center. Lighting is designed to vary with the amount of natural light entering the building. Sun sensors automatically dim the lights on sunny days. Solar tube skylights and clerestory windows also reduce the need for additional lighting. Low flow restroom plumbing fixtures rely on rain water runoff from the roof which is collected and stored in cisterns. The center also uses recycled materials such as rubber flooring and recycled carpets along with some American chestnut wood salvaged from old barns. Twenty percent of the materials used in construction of the center were manufactured or harvested within 500 miles, thus also reducing the use of fossil fuels for shipping. Smoky Mountain Turkey Tail mushrooms are always in season! Trametes versicolor (common name Turkey Tail mushroom) is a decomposing polypore mushroom found on logs, stumps and dying trees all across North America. You can find them year-round in an array of beautiful colors, concentrically lining the fan shaped or circular caps (zonate) and growing in rosette patterns or overlapping clusters on dead or dying hardwoods and sometimes conifers. The underlying pore surface has 3-8 tiny pores per mm that starts out white but gradually ages to buff or darker, with a white spore print. This mushroom is thin and flexible when young turning more rigid as it weathers and ages. The cap has zones of velvety or finely hairy rings, again weathering off sometimes with age. Not only are Turkey Tail Mushrooms beautifully photogenic, they are also being investigated medicinally worldwide. With their high levels of antioxidants and polysaccharides they are purported to help stabilize immunity levels and store energy to aid in the fight against colds, flu’s and the recovery process after cancer treatments. Turkey Tails simmered together with Chaga, cinnamon bark and pure maple syrup make a delicious tea. Make sure to check below the cap to correctly identify Trametes versicolor, for there are many Turkey Tail lookalikes with larger pore surfaces, toothed pores, even gills or just smooth. Be advised: If you have never collected wild mushrooms always go with an expert who can identify them! We strongly recommend basic mushroom identification skills acquired with picture taking, along with heavy research before attempting to ingest any wild mushroom. Although there are no known toxic polypores, there are still several highly toxic gilled mushrooms that can cause gastrointestinal disturbances or even death. Great Smoky Mountains National Park prohibits the removal of mushrooms, plants, animals and historical artifacts. Please respect park regulations so the next visitor can enjoy the parks beauty too. Remember to leave only footsteps and take only photographs! The hardwood coves of Greenbrier, Cosby, Deep Creek, Cades Cove and Cataloochee are great places to view Turkey Tails so make sure and have plenty of memory available on your camera and enjoy. HeySmokies mycology enthusiast, Jennifer M, loves wild mushroom hunting!